The visual version of Jason’s single features a new performance of the song superimposed against an ever-changing array of images and video. In the beginning, you see Jason as a child, pretending to hold a microphone and sing, and swinging a bat in Little League, along with footage of his hometown of Macon, Georgia. From there, it follows Jason’s career, from his early gigs to the stage of the Academy of Country Music Awards, where over the years, he’s collected three Entertainer of the Year trophies and was named Artist of the Decade. Perhaps the most moving section of the video pays tribute to the victims of the Route 91 Harvest Festival mass shooting in Las Vegas, where more than fifty people lost their lives. Jason was onstage when the shooting began. In the video, you see the front pages of newspapers the day after the tragedy, as well as a makeshift memorial, and footage of Jason meeting with survivors. 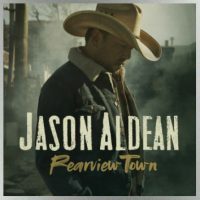 You can check out Jason Aldean’s new “Rearview Town” video on YouTube now.